Public swimming at the London Aquatics Centre. Experience the London 2012 Olympic legacy in the London Aquatics Centre’s world class pools. This exciting venue is proud to open the doors for everyone to enjoy. 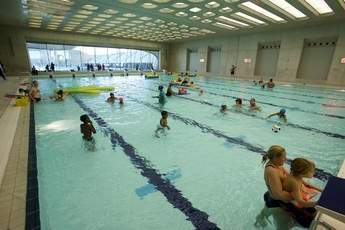 Public swimming sessions are open to every level of swimmer of all ages. 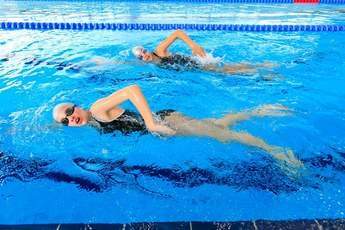 For beginners, children and less confident swimmers, the training pool, split into two 25 metre pools provides an exciting environment for a splash around. Discover which pool is best for your interests whether that be having a play about in shallow water, doing lengths, or diving. Please be aware of our swim safety rules before purchasing your tickets. The training pool looks out onto the main gallery, and is directly attached to the family changing area. Set up and split into two 25m pools, the training pool provides the perfect swimming experience for all level of swimmers, including the little ones who are keen to make a splash rather than do laps. Choose from 25m lane swimming sessions or general swim, where you and your friends and family can enjoy the pool in a more relaxed environment. The London Aquatics Centre also offers Family and Kids sessions, click here to find out more. Ready to come and take a dip in the water? You can book and buy tickets for all our sessions online and guarantee your slot. Please note online ticketing is Non Refundable. Each pool is heated, watched over by trained lifeguards, and maintained at the highest standard for swimmers. If you're a regular swimmer take a look at our membership packages, combine with gym and use of other leisure facilities across all Better centres or choose our deidicated swim only membership and benefit from reduced rates.